Be careful not to spill beveragesover the audio system. The use of a cellular phone insideor near the vehicle may cause anoise from the speakers of the audiosystem which you are listeningto. However, this does not indicatea malfunction. Usually, a problem with radio receptiondoes not mean there is a problem withyour radio—it is just the normal result ofconditions outside the vehicle. Fading and drifting stations—Generally, theeffective range of FM is about 40 km (25miles). Once outside this range, you maynotice fading and drifting, which increasewith the distance from the radio transmitter.They are often accompanied by distortion. Multi−path—FM signals are reflective,making it possible for two signals to reachyour antenna at the same time. If thishappens, the signals will cancel each otherout, causing a momentary flutter orloss of reception. Static and fluttering—These occur whensignals are blocked by buildings, trees, orother large objects. Increasing the basslevel may reduce static and fluttering. Station swapping—If the FM signal youare listening to is interrupted or weakened,and there is another strong stationnearby on the FM band, your radio maytune in the second station until the originalsignal can be picked up again. Fading—AM broadcasts are reflected bythe upper atmosphere—especially at night.These reflected signals can interfere withthose received directly from the radio station,causing the radio station to soundalternately strong and weak. Station interference—When a reflected signaland a signal received directly from aradio station are very nearly the samefrequency, they can interfere with eachother, making it difficult to hear the broadcast. Static—AM is easily affected by externalsources of electrical noise, such as hightension power lines, lightening, or electricalmotors. This results in static. The player is intended for use with12cm (4.7 in.) discs only. Extremely high temperatures can keepyour compact disc player from working.On hot days, use the air conditioningto cool the vehicle interior before youlisten to a disc. Bumpy roads or other vibrations maymake your compact disc player skip.If moisture gets into your compact discplayer, you may not hear any soundeven though your compact disc playerappears to be working. Remove thedisc from the player and wait until itdries. Compact disc players use an invisiblelaser beam which could cause hazardousradiation exposure if directedoutside the unit. Be sure to operatethe player correctly. Use only compact discs marked asshown above. The following productsmay not be playable on your compactdisc player. Do not use special shaped, transparent/translucent, low quality or labeleddiscs such as those shown inthe illustrations. The use of suchdiscs may damage the player orchanger, or it may be impossible toeject the disc. This system is not designed for useof Dual Disc. Do not use Dual Discbecause it may cause damage tothe player or changer. 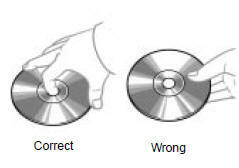 Handle compact discs carefully, especiallywhen you are inserting them.Hold them on the edge and do notbend them. Avoid getting fingerprintson them, particularly on the shiny side. Remove discs from the compact discplayer when you are not listening tothem. Store them in their plastic casesaway from moisture, heat, and directsunlight. To clean a compact disc: Wipe it with asoft, lint−free cloth that has been dampenedwith water. Wipe in a straight linefrom the center to the edge of the disc(not in circles). Dry it with another soft,lint−free cloth. Do not use a conventionalrecord cleaner or anti−static device. MP3 (MPEG Audio Layer 3) and WMA(Windows Media Audio) are audio compressionstandards. The MP3/WMA player can play MP3and WMA files on CD−ROM, CD−R andCD−RW discs. The unit can play disc recordings compatiblewith ISO 9660 level 1 and level2 and with the Romeo and Joliet filesystem. 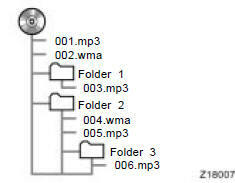 The MP3/WMA player plays back fileswith .mp3 or .wma file extensions asMP3 or WMA files. To prevent noiseand playback errors, use the appropriatefile extensions. Multi−session compatible CDs can alsobe played. MP3 files are compatible with the ID3Tag Ver. 1.0, Ver. 1.1, Ver. 2.2, andVer. 2.3 formats. The unit cannot displaydisc title, track title and artistname in other formats. WMA files can contain a WMA tag thatis used in the same way as an ID3tag. WMA tags carry information suchas track title, artist name. The emphasis function is available onlywhen playing MP3/WMA files recordedat 32, 44.1 and 48 kHz. (The systemcan play MP3 files with sampling frequenciesof 16, 22.05, and 24 kHz. However, the emphasis function is notavailable for files recorded at these frequencies. )The sound quality of MP3/WMA filesgenerally improves with higher bitrates. In order to achieve a reasonablelevel of sound quality, discs recordedwith a bit rate of at least 128 kbps arerecommended. The MP3/WMA player does not playback MP3/WMA files from discs recorderusing packet write data transfer(UDF format). Discs should be recordedusing “per−mastering” softwarerather than packet−write software. M3u playlists are not compatible withthe audio player. MP3i (MP3 interactive) and MP3PROformats are not compatible with the audioplayer. The MP3 player is compatible withVBR (Variable Bit Rate). When playing back files recorded asVBR (Variable Bit Rate) files, the playtime will not be correctly displayed iffast−forward or reverse operations areused. It is not possible to check folders thatdo not include MP3/WMA files.MP3/WMA files in folders up to 8 levelsdeep can be played. However, thestart of playback may be delayed whenusing discs containing numerous levelsof folders. For this reason, we recommendcreating discs with no more thantwo levels of folders. It is possible to play up to 192 foldersor 255 files on one disc. CD−R/CD−RW discs that have not beensubject to the “finalizing process” (aproc ess that allows discs to be playedon a conventional CD player) cannotbe played. It may not be possible to play CD−R/CD−RW discs recorded on a musicCD recorder or a personal computerbecause of disc characteristics,scratches or dirt on the disc, or dirt,condensation, etc. on the lens of theunit. CD−R/CD−RW discs may be damagedby direct exposure to sunlight, hightemperatures or other storage conditions.The unit may be unable to playsome damaged discs. If you insert a CD−RW disc into theMP3/WMA player, playback will beginmore slowly than with a conventionalCD or CD−R disc. Recordings on CD−R/CD−RW cannotbe played using the DDCD (DoubleDensity CD) system. This is a general term that describes theprocess of writing data on−demand toCD−R, etc., in the same way that data iswritten to floppy or hard discs. This is a method of embedding track−relatedinformation in an MP3 file. This embeddedinformation can include the tracktitle, the artist’s name, the album title, themusic genre, the year of production, commentsand other data. The contents canbe freely edited using software with ID3tag editing functions. Although the tagsare restricted to the number of characters,the information can be viewed when thetrack is played back. WMA files can contain a WMA tag that isused in the same way as an ID3 tag.WMA tags carry information such as tracktitle, artist name. This is the international standard for theformatting of CD−ROM folders and files.For the ISO 9660 format, there are twolevels of regulations. The file name can have up to 31 characters(including the separation mark “.” andfile extension). Each folder must containfewer than 8 hierarchies. Playlists created using “WINAMP” softwarehave a playlist file extension (.m3u). MP3 is an audio compression standarddetermined by a working group (MPEG) ofthe ISO (International Standard Organization).MP3 compresses audio data toabout 1/10 the size of that on conventionaldiscs. WMA (Windows Media Audio) is an audiocompression format developed by Microsoft.It compresses files into a size smallerthan that of MP3 files. The decodingformats for WMA files are Ver. 7, 8, and9.